Here are DVDs from a wide group of sources. In some cases we are almost the only distributors. As usual we have viewed these and find them some times good, some times great but always at least acceptable with information that can be relied on to the extent one might wish to rely on a DVD in lieu of a living teacher. A challenging two minutes. This sword, though peppered with beautiful postures, is not a “sword dance” form but a classically constructed form with authentic usage. Some lines even look more like fencing class than performance. Movements show the impulse of energy and intention. Off-angle striking, extended and balanced hitting postures, movements with notable body torque. The whole set is worth it just to see “Riding the Donkey Backwards.” All actions are organic, natural and without pretence. Teacher Yan's atittude is gracious and refined. The kind of set that fultils the definiton of art, something that you can come back to over and over. In addition there is about twenty minutes on straight sword basics. Our only reservation is that Teacher Yan—holding a Ph.D. in Chinese Martial Arts and a Masters degree in English—is very soft-spoken so you may have to raise the volume a bit to hear everything. In addition, this DVD comes with a 64 page detailed text. Instructor Yan shows the key movements of swordsmaship including unusual angles and tight footwork. Jack Yan, is a martial artist, teacher and musician. In Tai Chi he is the disciple of the world-famous Chen Zheng Lei. Here he demonstrates a long and strong sword form with a wide range of technique and very few pretensions to be charming. First you should know that Mizong=Lost Track=YanQing. The YanQing Boxing of Chen FengQi comes from CangZhou, one of the centers of Lost Track style. At eight he started training with Chen YuShan. 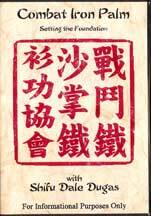 In 1930 he enrolled in the Nanking Guoshu Institute. After graduating in 1934 he became a teacher there until the Japanese attacked that region in 1937. In this 1983 demonstration—part of China's nationwide martial survey— he is 72 years old. At first one might think the large loose arm movements and the Northern style stances are simply Shaolin, and indeed—since Lost Track originated from Shaolin—that is a valid observation. But Lost Track has not been standardized to a presentation art attempting to look ancient. Actually watching the fast, graceful and loose performance of Chen we are probably watching what Shaolin looked at in its most sophisticated incarnation. A fine presentation, especially for a martial artist of this age. Once again an old instructor, Liu ShuiJie, comes with very traditional and folksy Kung Fu training. Here is a good example of how village Kung Fu has been taught for centuries. Of course there is a form, or forms, but they serve a different purpose than exhibition. This DVD has two very short partner forms that can be practiced as a continual reversing loop where each partner plays each section for a time. The first form shows a lot of strikes with tight counters and attack much like the Xing Yi form An Shen Pao. The only distraction, and it's a good one, is that Teacher Liu throws in a lot of possible variations from each position. The next small form, also about 20 moves, is almost the opposite experience with the arms continually wrapping and twining around one other. Finally a single movement is shown where, from a fighting position, one opponent tries to throw the other; this exercise develops sinking qi. Mr. Liu is in his seventies, a little infirm, sometimes a bit blustery. We like him and we like this original folk approach. This is a life work for this man. He studied under three top traditional instructors melding their information into his style of Immortal Fist. 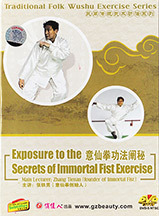 In this part of his legacy he takes many of the standard exercises every does mindlessly like arm swings and shows the meaning and usage of these basic and fundamental movements as arm whipping, shaking limbs, His perspective is Chinese, not modern, and he explains basic movements within the context of qi movement and other traditional concepts. He shows moves like Butterfly Flies, Grind the Pan and Cloud Hands (in case you thought it was only a Tai Chi move). Many recognizable core exercises done in a unrecognizable way. No applications. See immediately below for more on this rare style. First: you should know that this is NOT the Eight Drunken Immortals style, a much more common branch. Based on the Eight Immortals of Chinese mythology, we have here a complete system derived from Shaolin. What we also have here is an exhaustive historical example of Kung Fu, the folk art. 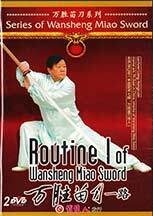 Sifu Liu is passing on the essence of his system through this DVD by coming right out and showing the entire unified structure of the Ba Xian Quan as a fighting art. We are seeing more and more of this as the traditional styles are going begging for inheritors. Truly a shame. In this case the style is a beautiful series of graduated exercises which start as what one might call vigorous Qigongs and progress easily and rapidly into defense applications. Form is not emphasized, though it is demonstrated. This DVD is about fighting skill. 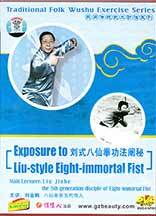 Though Liu is older and not necessarily in the best health, his mastery of his style still shows through. The Chin Na is forceful and definitive, the striking oblique and sophisticated. This is a real survey of a style which may not be long for this world. Read about this rare style. The first set is about an even distribution of single and double handed actions. It covers a good deal of ground, has many movements including pausing and actually THROWING DAGGERS from his pouch at different parts of the form. A nice set but we suggest learning it with a wooden weapon first and keeping your friends out of the path of the daggers. Actually a shorter set. More intense. NO DAGGER THROWING. The movements here show more power and concentrated effort. Definitely based on Form #1 this version shows a somewhat more advanced series of about 65 movements. 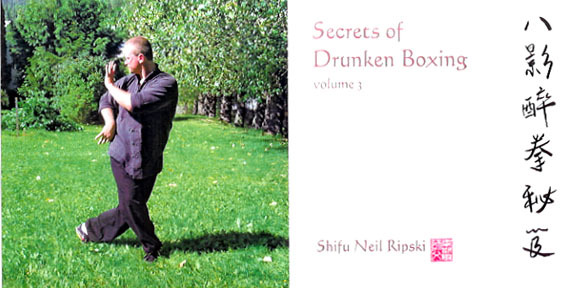 This third DVD shows a complex Drunken form. The movements are not contemporary Wushu but based on traditional Kung Fu postures flavored with Drunken emphasis. The form doesn’t take up a lot of space but it does go through a lot of postures such as the wine drinking, the whirling arms overhead, ground rolling and staggering to strike with the shoulders. 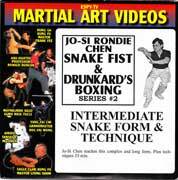 Rondie Chen shows the form breakdowns and then applications hidden in the form making some moves which give authority to Drunken usage and a few moves that might not look as functional but do represent the open-ended nature of Drunken boxing. NTSC: $19.95 each or a 10% discount for ordering 3 or more ESPY DVDs. NOTE: JO-SI RONDIE CHEN began his study under Grandmaster Chen Sha Hai at the age of five in Beijing, China. He also claims to have come from generations of Northern Snake Fist teachers. 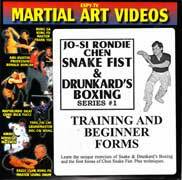 Besides learning Snake Fist, Jo-Si Chen learned Drunkard's Boxing and Wu Shu. Chen is also an honorary member of the Bejing Wu Shu team. JO-Here's an intermediate form in the Snake style with complimentary techniques shown. Sifu Rondie Chen shows the basics of the Northern Snake fist style. 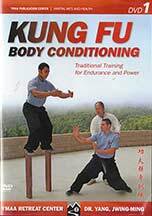 Most of the instruction is centered around a few of Chen’s students so there is an emphasis on strength and stretching particularly appropriate to younger martial students. First he shows Dragon Fist Palm and then a very long kicking and stepping set. 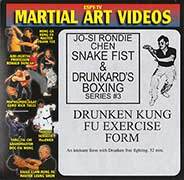 Toward the end of the DVD he shows the basics stretching and basic actions of Drunken Boxing. Some fast hand exercises and applications are shown. Coiling Dragon Internal Arts's head instructor demonstrates how to safely train your hands in the authentic manner. This program is for dedicated students who want to learn the old school way of training the hands. 2. Use of Authentic Iron Palm medicine: what it is, when to use it. 3. The four basic methods trained. 4. Internal exercises that will propel your training to the next level!! 5. These and much more!!" Most of these forms are wll-practiced Contemporary Wushu versions for these weapons. What we like about these presentations is that most movements for this level of weapons work is firmly based in principles of physics and therefore there is a great consistency between traditional and contemporary arts. In our opinion such usage corresponds about 80% of the time to traditonal techniques. The only differences lie in the contemporary focus on performance and the lighter weight of the weapon which does indeed allow some movements that might otherwise be difficult. With weapons like these the most important thing is clarity of instruction. These presentations are well photographed and follow of kind of self-regulating instruction where the section is shown over and over with some commentary on the sound track. You should be reasonably advanced to try these movements. Note: We had a little trouble playing these on our Mac, didn't recognize the DVD. On the other hand we had not trouble with VTR's and Eric assures us he has tried them everywhere without problems. Just a note to those who might be concerned. 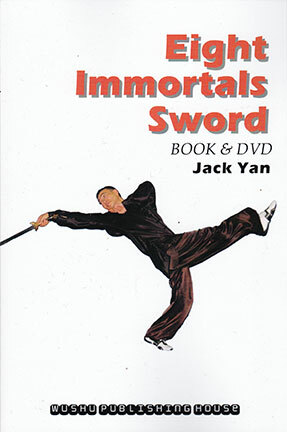 Here is the companion DVD for Eric Yao's book on this famous weapon. In this DVD he uses a double screen technique to show the dart at simultaneous two angles allowing the viewer to see the whole length of the action while also monitoring the intricacies of hand motions and controls. As most who have seen it know, the rope dart is the most sophisticated of Kung Fu weapons regarding angles, involutions and folding. It is a three dimensional course in topology where the user wraps around the elbow, knee, foot, neck or whatever and then uses increased angular momentum to accelerate the dart on its long rope. Like a Yo-Yo? Yes, and indeed some people have said that the Yo-Yo was adapted from a version of this weapon supposedly utilized in the Phillipines. Remember to wear a helmet at first. Click on right picture to see Eric Yao's companion book to this DVD. Eric Yao's performance of the Tiger Hooks is rhythmic and controlled with a light touch. This tempo and attitude well preserves the general tone of the weapon. A good performance, backed by tournament competiton footage and breakdowns. Good control of the weapons and some rolling and jumping actions. No usage but the set performed without the over-extensions which so often plague this weapon. The chainwhip is a wonderful and exciting weapon especially if you are the one whirling it. A light whip but a good sense of mastery. Some butterfly kicks, ground rolls and bumps and jump turns. The essential actions are here and there is a nice section at the end of outtakes. You should have some familiarity with soft weapons before attempting this instrument. This is a Contemporary Wushu performance and the DVD has not only instructional material but also real competition performances filmed in Hungary and Brazil. Eric Yao has a good sense of martial movement and this adds an intensity to the Drunken Sword performance. 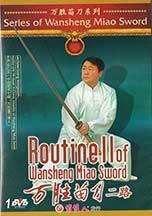 There is also an interesting section at the end showing Yao practicing and overdubbed with comments and advice on the practice of the sword. A nice presentation and, as we have been seeing lately, a performance that spans traditional and contemporary values more elegantly. Tak Wah Eng's DVDs always take an interesting slant on the material. In this one long stretches of silent footage, often "aged", build an impressionistic view of the Iron Palm practice. Cut to Tak breaking a brick. Cut to brass rings on his wrists. Cut to him applying lineament. Each of these sections is essentially silent showing rather than telling of Tak Wah Eng's practice. All are authentic Iron Palm drills and it is interesting and informative to see his regimen actually performed. A great DVD for "following along." This Triple DVD is a photographic record of many styles. It is also a kind of document because it records, often in very informal circumstances, the status of a number of older teachers. See below for a list of all the styles and demonstrations covered.Some of these are, basically, footage taken at work places where casually dressed practitioners show what forms they know. The first disk has many shots of Taiwanese Temples and many of the demonstrations are performed in front of them. Here is a list of the forms. The Chinese version of Black Scorpion? Dressed in camouflage fatigues Yu Hong Jin demonstrates numerous methods of Chin Nah for downing an attacker. Actually her Chin Nah is good. And the techniques demonstrated are accurate and numerous. It's basically a one hour Chin Nah lesson with someone who knows something, for a very low price. Some of the movements are certainly more effective than others but this is the classical way to introduce the information. As a Judo player will tell you not every move, Osotogari for instance, is actually immediately effective but rather lays the foundation for all further knowledge. It is well known that "animal play" came into existence with the creation of the famous doctor, Hua Tou. Hua's assistant, Peng, lived to be over 90 and all information was supposedly passed from him. It was about two centuries later that the Shaolin temple developed it Five Animals. The doctor's original intent was strictly for health and encompasses imitating the movements of the Monkey, Tiger, Deer, Bear and Bird. Only wood block prints still remain of the original postures so there are many derivative versions. This is one and not bad at that. If we ever remember we have an excellent version that is probably one of the most accurate should we some day get time to record it. The Five Animals doesn't exactly exist as a Chi Kung but it might be considered a Dao Yun series. A very enjoyable exercise system. The Eight Pieces of Brocade is an ancient, famous series of exercises. It is relatively easy. Divided in eight small sections it follows the principles of Chinese medicine and can be classified as not only a Qi Gong, but a very early one. First mentioned in the Song Dynasty in Yi Jian Zhi by Hong Mai, it has kept alive - though somewhat varied - for all these centuries. There are two forms of Ba Duan named Wen Duan and Wu Duan (sitting and standing) with only the standing form shown here. There are also North and South versions. Dr. Yu Ding Hai of Shanghai Chinese Medical College demonstrates clearly and slowly with much explanation. 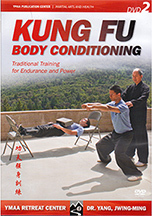 One of the most famous of all Chi Kung regimens. Said by some to have been created by the culture hero, Yueh Fei. Others consider it a Shaolin original with strong roots in Yogic practice and one of the cornerstone of the style (there is indeed some evidence of this being true). Ba Duan Jin is a place where calisthenics meets Chi Kung. Not nearly as easy as many other versions this style has Shaolin flavor. Some pretty low positions but also many of the exercises are thankfully introduced in a layered fashion that allows the student to pick his punishment. Actually a crucial part of historical Kung Fu movement. "The brutal joint locks and pressure point striking of Eagle Claw is revealed here for the first time. Known as Chin Na, this arsenal of attacks and counterattacks teaches you how to take advantage of the natural strengths and weaknesses of the human body. This amazing 2-person form trains you in the powerful techniques of Chin Na, with a "hands on" method for practice. Using this traditional sparring form, you and a partner can safely train these destructive attacks without fear of injury. Even if you train alone, just witnessing this video will reveal many fighting "secrets" of this ferocious style. Packed with joint-wrenching techniques, Grandmaster Lau reveals how you can follow the way of the Eagle to turn your fingers into destructive talons and hit anyone at their weakest points. You will learn how to bring down the fiercest opponents." NOTE: This DVD contains sections 1 through 72 of what were originally TWO VHS tapes. This DVD is complete and shows the whole form.